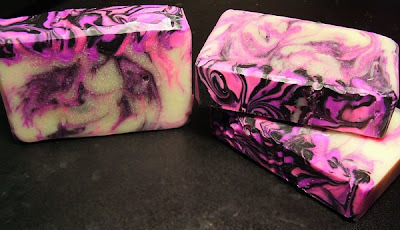 ran out of some soaping oils but will have them back in stock next week then back to making soap. Next up will be Stonehenge: Archipelago Type Smoked Cedar Wood, Bergamot, and Amber blend perfectly to invoke the ancient mysteries of the Druids! This scent tested really well with my pickiest male clients so I have decided to make a batch up. Ladies loved it for themselves as well! Going to play around with black and white colors I am thinking so stay tuned. This scent is a nice male or female scent. Right in the middle type one, well the colors I did before I think put off some of the male clients from picking it. See attached picture. So I was thinking a good time to change it up some. But I can't decide what to do, one big problem is this scent moves super fast so I really don't have much time at all to play with it. It will pretty much be a main color for the batch and maybe a top layer, no time for swirls. I was thinking maybe a dark blue/green combo or dark blue/lime green. Maybe even a white with a blue top layer? or some other color combo? I may just end up standing there and at the last second decide what color to toss in.